When logging in to your Sleeknote account, you'll be redirected to your dashboard. 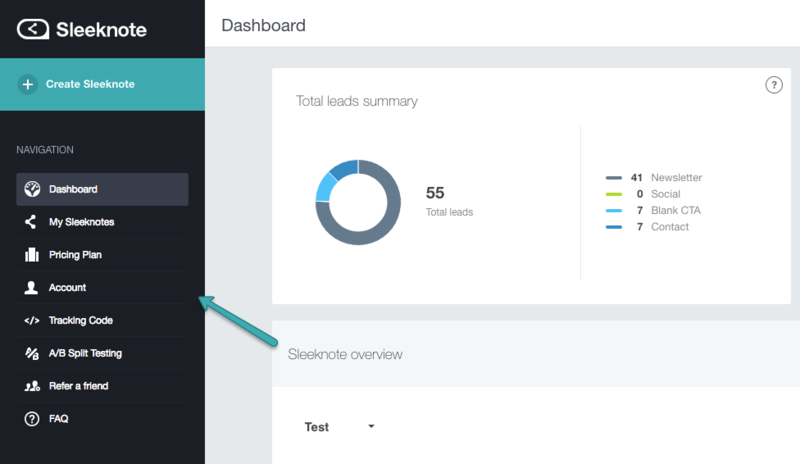 The dashboard gives you a quick overview of data's based on the performance of your campaigns. To the left you'll find a menu which provides you with information about your account, our pricing plans, the tracking code and the My campaigns page with our editor, which is where the magic happens. If you want a guide on how to use the editor, we suggest you to read the article Using the editor or click here to book an introduction with one of our customer success employees. When clicking on Account in the menu, you'll find a page where you can fill in relevant information about yourself and your company. Also, you might check out the Edit billing information tab and make sure that all the information in here is correct. If, at some point, you get a new credit card or similar, please update this information to make sure that your upcoming payments won't fail. If you'd like a colleague or a friend to have access to and be able to edit your campaigns, you can add their email address under Add additional user. On this page you'll be able to change you login information as well as downloading your invoices, if necessary. Under the Sleeknote badge tap you'll find an option to hide the Sleeknote badge from your sleeknotes at your website. However, this option is only possible with an annual subscription. For more information check out this link.